Carter Troy was born on September 23, 2015 at 1757. Since that very day, we knew that our Carter would make a grand entrance everywhere he went. His smile, his laughter, his interest in people and the way he captivates others with his loving and wild spirit. There is not one person that Carter has encountered that hasn’t fallen in love with him immediately. In August 2017 Carter’s geneticist told our family that Carter will write his own story. He will be the one to guide us down HIS journey with his diagnosis of ADNP. 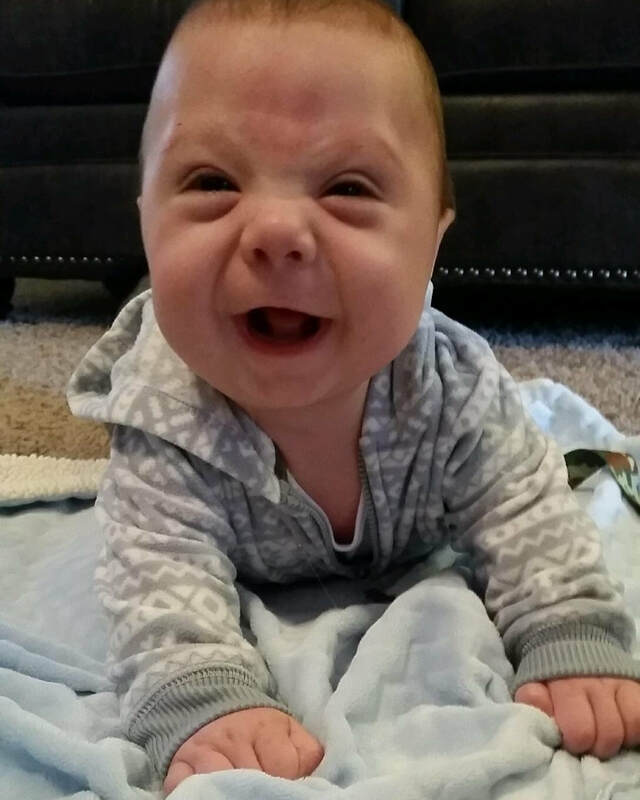 His story is meant to bring awareness to rare, genetic disorders and to encourage parents and family members to never give up and to advocate for those little ones who cannot, yet, speak for themselves. Going back a few years, pregnancy and childbirth were relatively uncomplicated and we were grateful for a healthy 6 lb 15 oz baby boy. As all parents do, we experienced the anxiety of driving our baby home for the first time. We excitedly introduced our son to our Fur Baby, Cali Jean, and settled into a routine of sleepless nights and day time cuddles. After a few days home, however, we began to have issues with Carter breast feeding and our little papas had NOT pooped. Looking back now, it all makes sense, but in the moment we were terrified and questioning every move we made. Once we cleared the hurdle of feeding and pooping (who knew poop could be something you cheered and danced for at wee hours of the night?!?) we continued on with daily life. 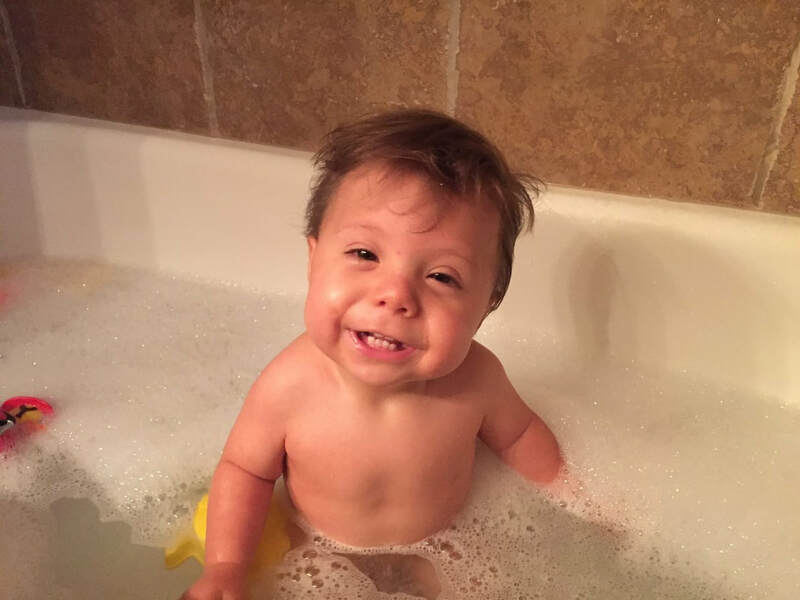 At around six months old, Carter was sitting and meeting milestones as expected. His six month check-up was normal and no concerns were ever raised by our pediatrician during that visit. However, a week after our check-up, we received notice of referrals that had been placed for optometry and audiology in the mail. I hurriedly called the pediatrician, knowing this had to have been a mistake. Our pediatrician stated there were some “features” of Carter that were similar to that of a genetic syndrome, Stickler’s Syndrome. She assured me that the referrals were just to play on the safe side because that next month our family would be moving out of state and she did not want our future pediatrician to sweep the signs she identified under the rug. I remember being so frustrated that our pediatrician did not have the guts to say all of this to me, face-to-face, Carter’s mom. Now, I thank her for initiating the long process that unfolded after those orders were placed. If it wasn’t for her “hunch”, Carter’s diagnosis may not have come as quickly as it did. When we finally moved and were settled, we established ourselves with another provider. I remember being nervous for the appointment because both my husband and I looked at our son and thought, there is NOTHING wrong with him. The visit with this provider is one I will never forget. I told her Carter’s history and presented the symptoms that the previous pediatrician wanted to have monitored. My husband and I both expressed that we thought everything was fine and we were pleased with his progress. The provider’s response is one that is forever engraved in my mind. She said “Of course there is something wrong, haven’t you seen other kids?”. Literally, jaw-to-floor, SHOCK. Her statement angered me beyond words and left me sobbing into my husband’s shoulder in the parking lot of the pediatrician office. I’ll never forget that day. And to be honest, it may have pushed my husband and I into denial about any current or future delays Carter began to show. Her lack of compassion led us to seek care elsewhere. Once we transferred to another pediatrician we all agreed, together, to monitor Carter’s progress. We allowed Carter to continue to grow and explore at his own pace, monitoring when milestones were / were not met. At around 12 months we did see progress, however, we all agreed as a TEAM that it was time to get additional resources involved due to various areas that were falling behind compared to others his age. Again, at this point, my husband and I did not envision a genetic neuro-developmental diagnosis. In fact, we truly believed that Carter was just on the “left side” of the growth and development curve. Slower than others but surely he would catch up, right?! 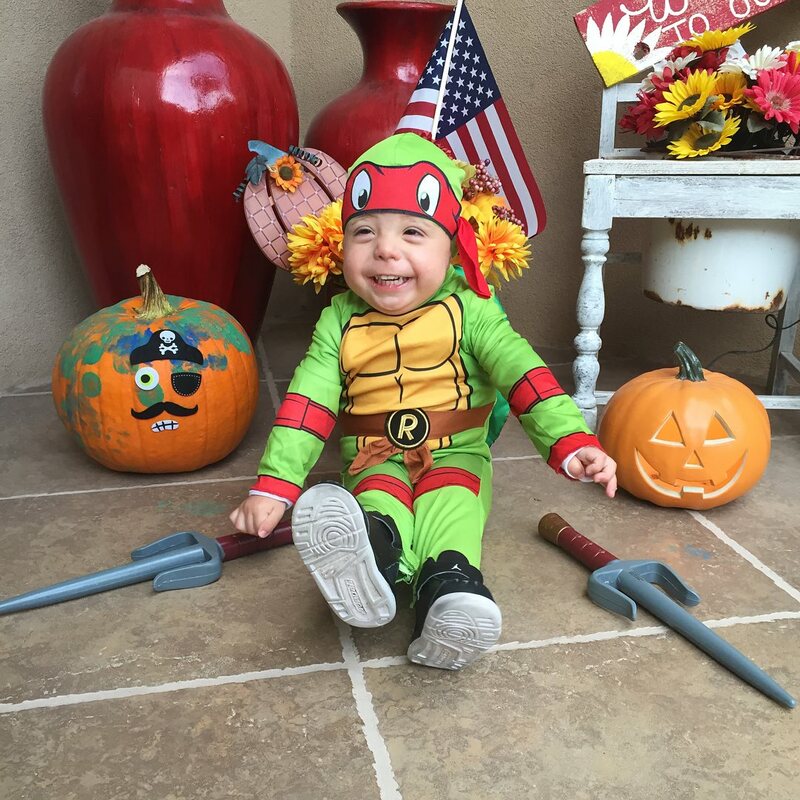 Carter began speech therapy, physical therapy, developmental therapy, and occupational therapy around 14 months old. Referrals were placed for Orthopedics, Optometry, ENT, and Genetics. My daily planner quickly began to fill up with therapies and appointments for Carter. I often thought to myself, are we doing the right thing? Are we searching for something that is not there? WHY is my son’s life revolving around all of these appointments, while other kids only had to worry about going to the dentist? Each appointment was nerve racking, I was terrified of what each doctor would say or recommend. But then when a doctor did not have an answer for me, I began to over think and continuously worry about what exactly could be going on with our son. 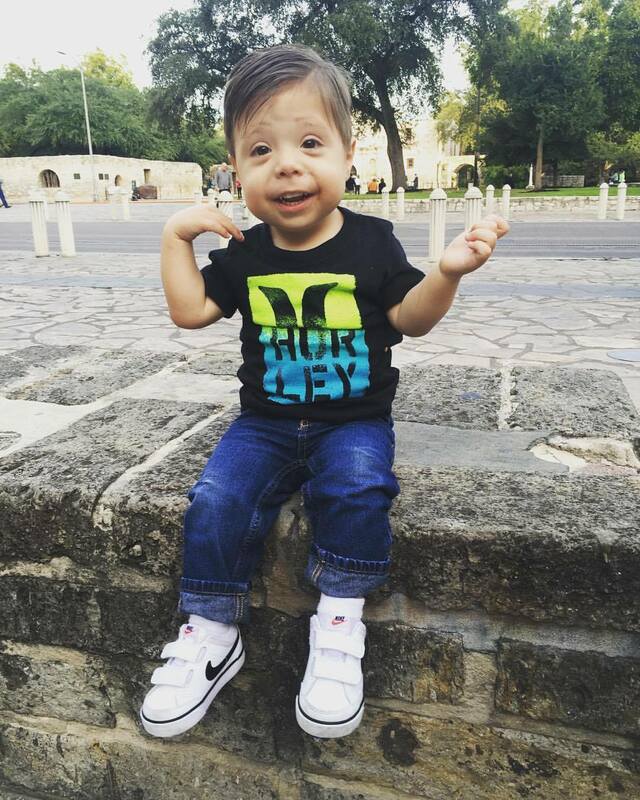 At around 18 months old, we flew to San Antonio, TX where we met Carter’s genetics doctor. She believed that there was a genetic syndrome occurring, yet with the various features and symptoms occurring, it was hard for her to put a name to it. Carter, myself, and my husband all provided blood samples that day. We were told to return in about six months and we would hopefully have an answer to what was going on. During that six month time period, Carter truly began to blossom. He began mimicking sounds, speaking some words and phrases, and moving around much more than ever before. 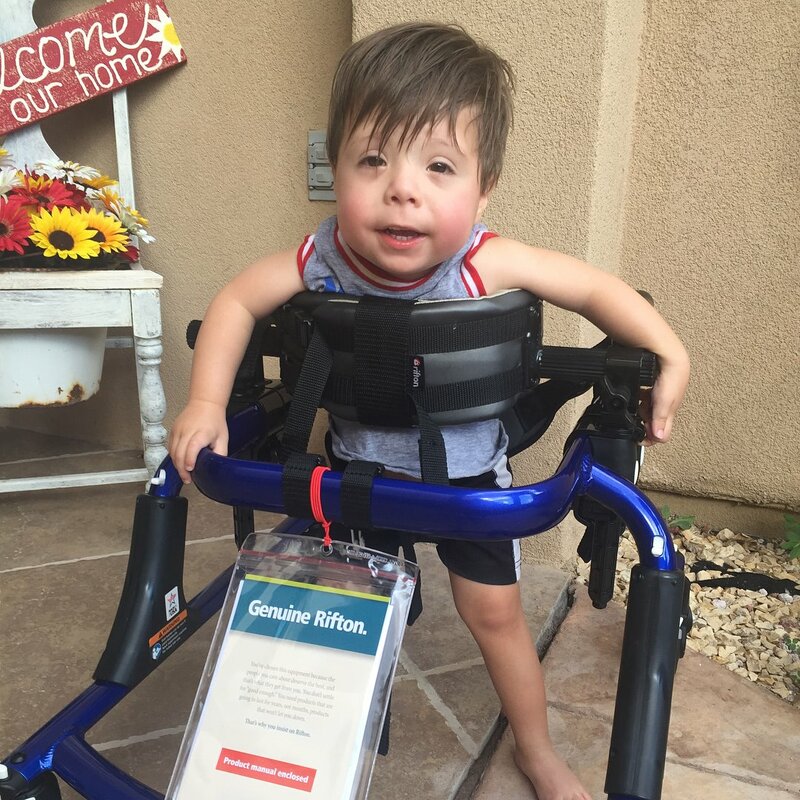 We were able to provide Carter with a gait trainer that opened Carter’s eyes to the world. The gait trainer allowed him to explore and to play with other kids. Carter went from watching the neighborhood kids play from his stroller, to rolling in the streets with them in his gait trainer. We are so grateful for all that his gait trainer has allowed him to do and experience. Additionally, he moved from the “infant” classroom at daycare to the “toddler” classroom. He began sitting in a regular chair for mealtimes at daycare, drinking from a normal cup, and doing things we had only dreamt he would be able to do so quickly. For others it may have been small milestones, but for us it was tremendous leaps. At Carter’s two year wellness appointment, we learned what Carter’s genetic diagnosis was. It was so overwhelming to be provided with an answer (unexpectedly) and to have to wait to see the geneticist to receive an explanation. Why? How? Who? So many questions ran through our heads. Would he live a normal life? Will he walk and progress with his peers? Even though we had the answer to “why”, we still had so many questions that needed to be answered. Two weeks passed and we finally made our way back to San Antonio, TX to follow up with Carter’s geneticist. We went into the appointment with an open, positive mind. We knew what Carter’s diagnosis was and knew that, as a family, we would, could, and WILL help Carter rise above the diagnosis. 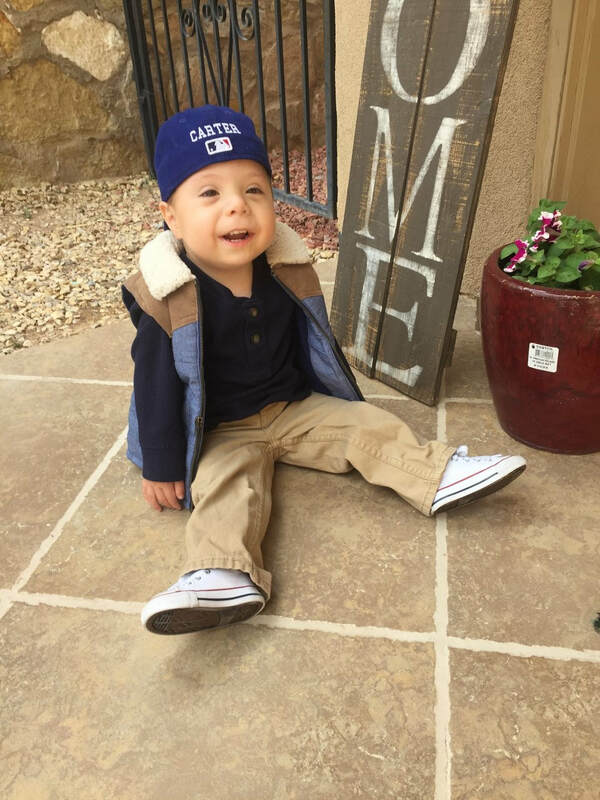 On October 18, 2017, Carter was officially given the diagnosis of Helsmoortel-VanDerAa Syndrome, or, ADNP Syndrome. This very rare, genetic disorder involves mild to severe delays in intelligence, speech and motor planning, and can involve Autism Spectrum Disorder. Problems involving the neurologic, cardiovascular, endocrine, immune, musculoskeletal, and gastrointestinal systems can also occur. Vision, hearing, growth, feeding and sleeping can also be affected due to the above body systems that are involved. We were told that the genetic disorder did not come from mom and it did not come from dad. It was strictly a course of nature. 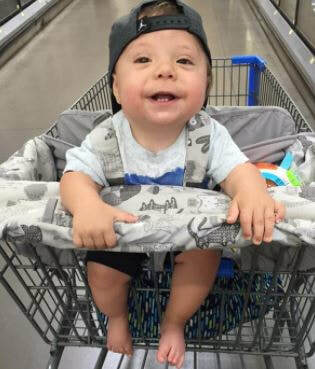 Even though no parent wishes for their child to have a genetic disorder, we knew that there was NO possible way we could ever imagine Carter without these characteristics. We had loved and cared for him, wholeheartedly, for two years already. His diagnosis did not change a thing. This is Carter. He is the boy that lights up a room with his smile and voice. He is the boy that blows the secretaries at his daycare kisses as he leaves for the day with his Mama. He’s the boy who loves to mimic monsters and has his mama and daddy playing monster too, out in public. Carter has overcome so much. Lab draws, diagnostic tests, doctor’s visits in and out of town, and weekly visits from multiple therapists. ADNP does not define Carter, Carter will write his definition of ADNP. Carter will write his very own story. We are currently focused on Carter building strength and meeting the goal of walking at or around 2.5 – 3 years of age (average age that child with ADNP walks). Additionally, Carter is progressing verbally and is able to speak 17 words and/or expressions. His first body part that he learned to identify was the heart (boom boom) and he can now point to his hair, nose, belly, feet, and booty (haha). His hand-eye and fine motor coordination is progressing at a steady rate, with the ability to feed himself with a spoon/fork (usually he just likes to use the whole hand to mouth method and get food EVERYWHERE) and he has successfully learned to drink from an open mouth cup. 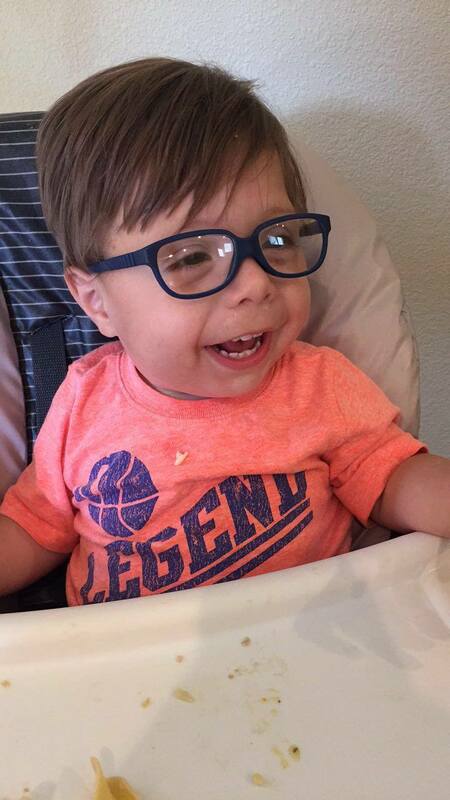 Carter is always motivated by food, music, and especially by other children. His interaction with peers in daycare has led Carter to make tremendous progression in all areas of development. We truly are so grateful for our pediatricians, therapists, case managers, daycare teachers, and specialty physicians that have helped Carter get to where he is at today. Without their help and encouragement, I do not believe that Carter would have progressed to the level he is currently at. As my husband reminded me.. Carter is going to wake up tomorrow and still need us. His parents, his family, his friends, his teachers. Carter needs all of us to help push him and make him the best Carter that he can be. His diagnosis does not change our unwavering love. We will continue to fight for the best care and opportunities. Hopefully our Courageous Carter can inspire parents to voice their concerns and to overcome any obstacle that may interfere with getting a child the help they deserve. There is no telling how Carter Troy’s story will unfold. However, we know that we will be with him every step of the way. I’ve never been one of those Moms who joined Facebook groups and attended play dates. I never quite felt like we could relate. In fact, the one time I did attend a children’s play group with Carter, we were faced with more questions than actual play time and interaction. “Why is he not walking yet?” “Why does he wear glasses?” were just a few of the questions that came our way. They were all innocent questions but how could I be so open and honest with these people I just met? Would they even understand what we were going through? I longed for a connection with another parent that would understand and celebrate our milestones. When we finally learned Carter’s diagnosis of Helsmoortel Van Der AA Syndrome, my husband and I jumped onto Google search. The adnpkids.com site was one of the first to pop up. I was amazed at the stories and read each one of the children’s bio’s, not once, but two and three times. I smiled, I cried, and I cheered the children on through my tiny iPhone screen. I could not believe that there were so many other children that were just like Carter. And guess what, that meant there were other parent’s that were just like ME. When I learned about the Facebook support group I instantly requested to join. I emailed Sandra Sermone that same day and shortly after had such an inspirational phone call with her. I instantly knew that she had created a safe haven for parents through the online parent support group Facebook. Our family was greeted with such a warm welcome. I felt overwhelmed with so much love and support that I couldn’t help but cry knowing there was finally a group of people who knew exactly what our family had been going through. 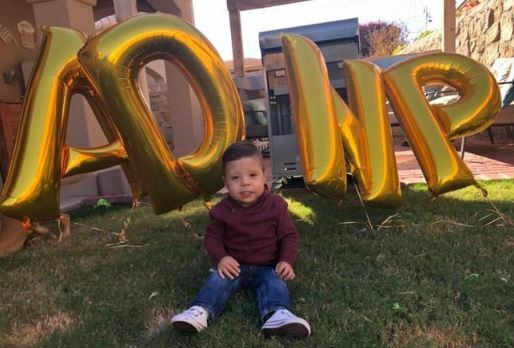 Since that first day, I have been able to use the ADNP website for information to guide our therapists, doctors, and close family and friends through Carter’s diagnosis. Additionally, the Facebook support group has allowed me to connect with other Moms that celebrate each child’s milestones, whether small or large. I have finally been able to find the connections that I so longed for leading up to Carter’s diagnosis. Questions, advice, and comfort are offered without hesitation. Our family looks forward to the ADNP future and hope to meet the ADNP family one day. Until then, thank goodness for Sandra creating what I truly believe is an environment us ADNP parents are forever grateful for. ADNPkids would like to thank Carter's amazing father for serving our country! Raising a special needs child is extremely hard. 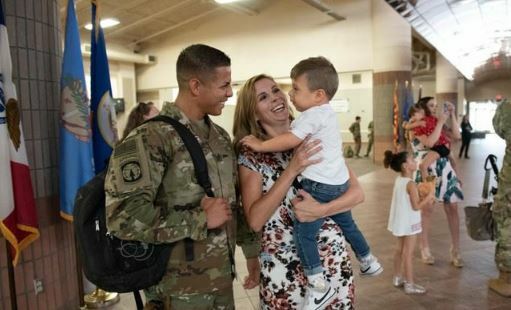 To do it as a military mom, where sometimes their spouse is deployed takes on a new meaning of Superhero! So thank you to Carter's amazing mother as well! Courageous Carter has continued writing his ADNP journey, several pages in fact. He is now almost 3.5 years old and continues to captivate hearts of those around him, daily. We received the diagnosis over a year ago, yet it does truly feel like just yesterday we received the news. Maybe it’s because we are frequently reminded of what it is like to receive a diagnosis, as new children are diagnosed with ADNP so often. As a family, we have been humbled by the out pouring support of family, friends, and the medical community. We have never experienced so much love and can rest assure that Carter’s corner is full of cheerleaders every step of the way. So thank you to those who have stepped up and given us the support we needed without hesitation. 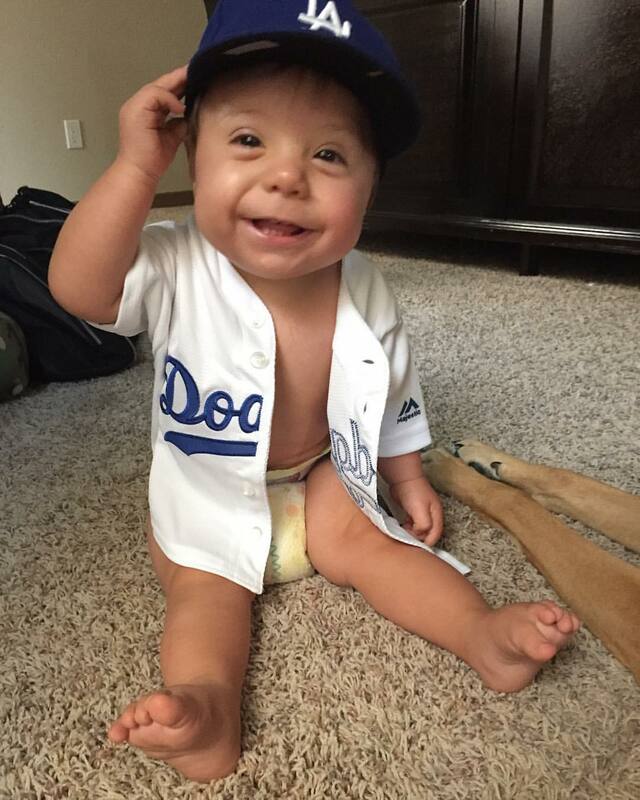 Over the past year, Courageous Carter has met some exciting and foundational milestones. At 2.5 years old, he started taking steps on his own. It was a milestone we worked tirelessly for, 3 hours per week of physical therapy and constant practice at home. I joked that Carter had eaten his weight’s worth of fruit snacks because that was one of the motivating factors getting him to move one foot in front of the other. Carter’s Dad returned from a 9 month deployment around this time and tears streamed from our family’s eyes as we proudly watched this sweet, strong boy walk to his Daddy for the first time. Carter learning to walk certainly brought out the toddler in him, as we began chasing him within the house and began finding ourselves in between anxious and proud as he scaled furniture and stairs we never considered dangerous before. 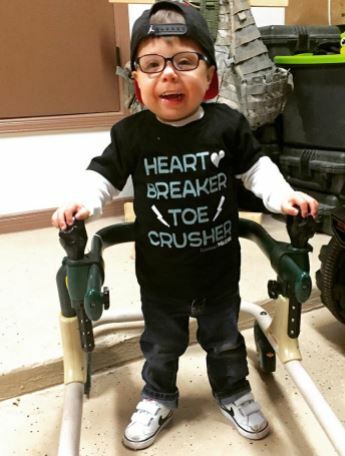 Walking isn’t the only milestone our Courageous Carter has met. At the age of 3, he entered the public school system and has thrived within his special education Pre-K classroom. His first day of school is a we all will remember. We dressed him anxiously, early that morning, tucking in his collared shirt into his pressed khaki pants, snapping pictures every minute along the way. That morning he walked excitedly up to his teacher and gave her a big hug, reassuring us all that he would do just fine in his new environment. He’s been said to be a “shining star” and a “joy” to have in the classroom. His enthusiasm for learning is a trait we are so grateful for and know it will take him far. The transition from Early Childhood Intervention into the school system was a new world for us, full of acronyms and new faces. Yet our ability to advocate for Carter allowed us to continue to pave the way for his successes. He continues to receive physical therapy, speech therapy, and occupational therapy within the public school system. He also participates in an adaptive PE class and will start music therapy soon. He continues to participate in private physical therapy, where he recently learned to ride a tricycle. He’s begun a new therapy, myofunctional therapy, and is adapting well to all of his new skills and tasks introduced to him. He continues to spend over 20 hours a week making tremendous strides within his ABA therapy and surprises us all with new words, phrases, and songs. He is now speaking over 200 words, forming 2-3 word sentences, and following simple commands, including some small chores around the house! He can say his ABC’s and recognize every letter of the alphabet, even out of order! His ability to count has surpassed all of our expectations as he recently counted to 40! 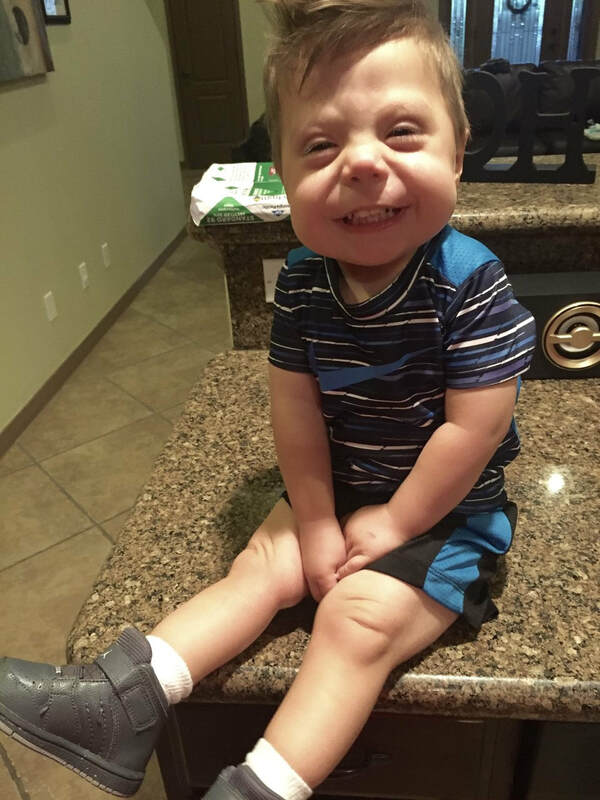 Courageous Carter continues to love popular nursery rhymes but has also continued to have love for all music, including country, pop, and oldies! Our goals for the next year are endless but continue to have a focus on maximizing his ability to communicate and socialize with others. 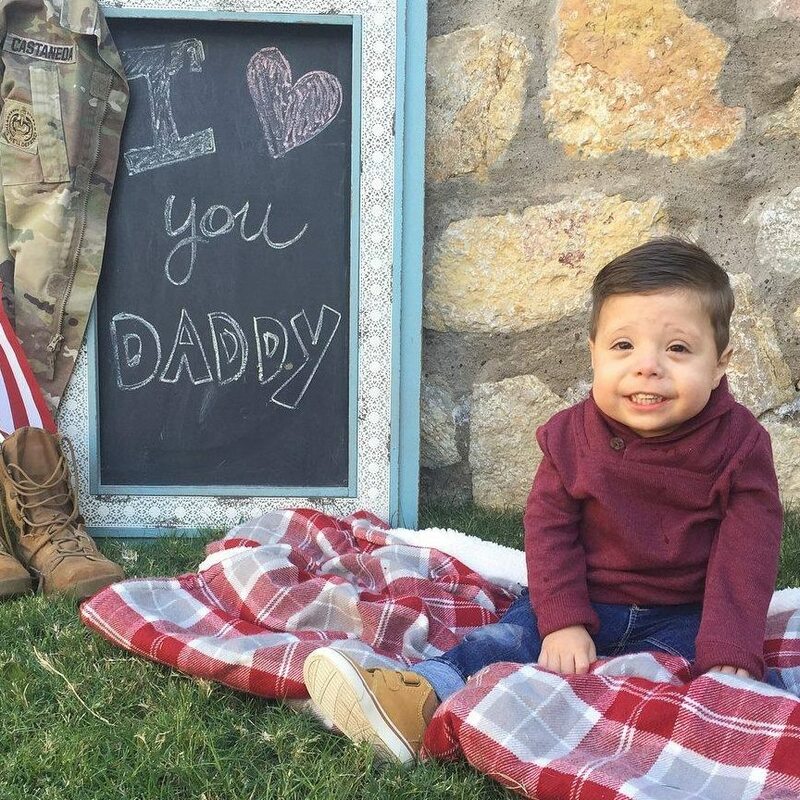 We know that there will be good days and bad days ahead of us but when we look back on Courageous Carter’s story, we know that every day spent with him is a blessing in itself. He has taught us more about life than we will ever be able to teach him. We are forever grateful for this journey and cannot wait to continue helping our son write his journey.